What Groceries Can I Freeze? 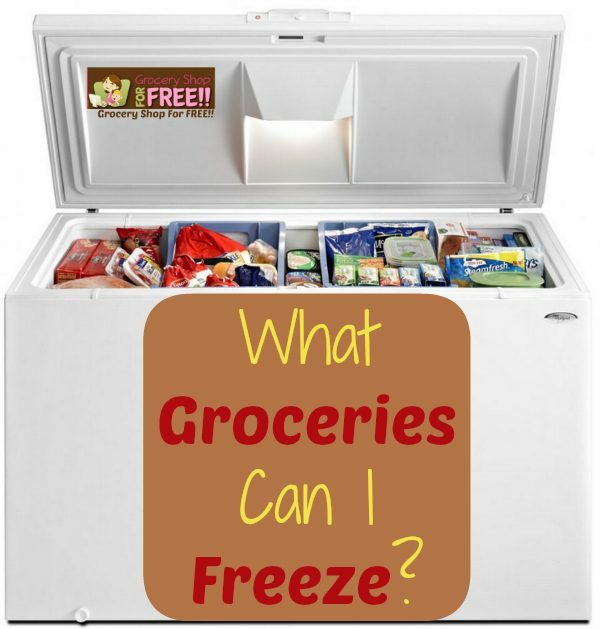 You are here: Home / DIY / What Groceries Can I Freeze? One question I do get asked a lot when I am teaching classes is “What Groceries Can I Freeze?“. The best way to make great use of your coupon shopping is to stockpile. When you decide to begin stockpiling, questions begin to arise – like “What about the sale by date”, or “Can I freeze this?”. All of those questions are important things to think about when stockpiling. Today I want to cover freezing. I have mentioned before that I would freeze extra milk when I buy it at a good price, and some of you said you didn’t know you could freeze milk. Milk – Just remove some before you freeze it, it will leak out the top as it expands while freezing. Sometimes you may have to shake it after thawing if it separates. Tub Margarine/Butter – I freeze these all the time. Depending on the brand and kind I may have to re-whip it when it thaws because it separated, but that takes just a few minutes and it tastes great! Cheese – I freeze cheese, too. block or shredded. No problems. Cakes – I used to do some decorating and I will tell you there is nothing more moist than a cake iced while frozen (which is easier by the way) and then allowed to thaw under the icing! try it! Canned biscuits – Depending on the brand sometimes they don’t rise as high as they do before they are frozen. Wholly Guacamole – It thaws out easy and tastes great. Lunchmeat – A lot of times I find a canned ham that is cheaper, once sliced, than lunchmeat. I usually find a canned ham around 5 lbs and take it to the deli or butcher and ask them to slice it for me (they will do it FREE of charge) and then I take it home and re-package it in smaller packages and freeze the individual packages. Read about 10 more FREE Little Known Grocery Store Services! Eggs are a little more work – never freeze them in the shell – but you can break them open and whip them together and then you can freeze them. I have heard people who pour them in to ice cube trays and cover them with plastic wrap. Of course, you know you can freeze leftovers or even “freezer cook”. I cook large amounts of Spaghetti, Mini Meatloaves, Chili, Hamburgers, Chicken, Casseroles, Taco Meat pretty much anything. I then take them and separate them in a family serving size and freeze them. Then on nights when we don’t feel like cooking or don’t have a lot of time, we just pick something out of the freezer and we’re set in minutes! I usually keep my open Chips in the fridge to help keep them crisp longer – but, I have heard that you can freeze them with great success! Make sure to check out my “Fruits & Veggies You Can Freeze” post to learn more about freezing veggies and fruits! What have you had success freezing? I started freezing when I started couponing and stockpiling. It actually was a fantastic idea. In June, both me and my husband lost our unemployment. Thank goodness I had stockpiled! My stockpile got me thru 2 months until congress voted unemployment in again! Im still going off the same stockpile and not adding to it right now as we are in the middle of a move. @Shelly Ford: What an inspiration you are! Stockpiling is smart and I am so happy that you did that! Good for you! Thanks for sharing, I hope others will be moved to start stockpiling! how about OJ in the plastic bottles? I get fruits and vegetables when they are on sale, chop them up and freeze them in portions. Fresh fruits and vegetables always seem to go to waste in my house so I started doing that and it’s been great! Especially when things like strawberries, raspberries and blueberries go on sale! You can certainly freeze the turkey bacon. You can freeze lactaid Milk – thaw it completely then shake it really well to mix it back up. As far as the organic Half and Half – I think you’ll have to try it. Just freeze a small amount next time you get it and then thaw it back out and see what you think! I have always keep breads, bagels and english muffins in the freezer, thanks to this list I am going to start with tortillas and few other things too. Awesome! I love freezing my overstock, it’s very helpful to us! Do you freeze your pasta uncooked?won’t it get most and stick together? Sorry, that should say cooked pasta. There wouldn’t be any need to freeze uncooked pastas. I freeze just about everything, fresh chop then put into ice cube trays with water after they freeze just transfre to a freezer bag and when you need some just pop a cube or 2 in you pan. I really love to freeze red or black grapes, take a few out just like eating a popcile, i didnt care for the green ones though.